A long time ago, there was a huge apple tree. A little boy loved to come and play around it everyday. He climbed to the treetop, ate the apples, took a nap under the shadow...he loved the tree and the tree loved to play with him. Time went by...the little boy had grown up and he no longer played around the tree every day. One day, the boy came back to the tree and he looked sad . "Come and play with me" the tree asked the boy. "I am no longer a kid, I do not play around trees any more" the boy replied. "I want toys. I need money to buy them." "Sorry, but I do not have money... but you can pick all my apples and sell them. So, you will have money." The boy was so excited. 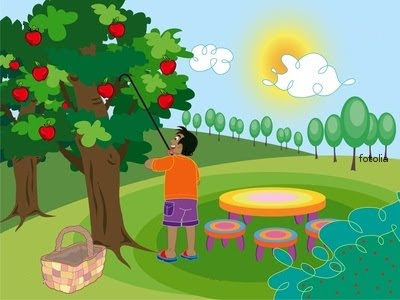 He grabbed all the apples on the tree and left happily. The boy never came back after he picked the apples. The tree was deeply saddened. One day, the boy who now turned into a man returned and the tree was excited "Come and play with me" the tree said. "I do not have time to play. I have to work for my family. We need a house for shelter. Can you help me ? " " Sorry, but I do not have any house. But you can chop off my branches to build your house." So the man cut all the branches of the tree and left happily. The tree was glad to see him happy but the man never came back since then. The tree was again lonely and upset. One hot summer day, the man returned and the tree was delighted. "Come and play with me!" the tree said. "I am getting old. I want to go sailing to relax myself. Can you give me a boat ?" said the man . "Use my trunk to build your boat. You can sail far away and be happy." So the man cut the tree trunk to make a boat. He went sailing and never showed up for a long time. This is a story for everyone. When we grow up, we leave them...only come to them when we need something or when we are in trouble.